Q – Will Project KARE take care of my flight and hotel arrangements for me? No. You must get to Thailand on your own. Project KARE is not a travel agency. We do not book flights or hotels. Please refer to the mission of our non-profit org. We welcome the opportunity to share information and our contacts with like-minded independent travelers and help them achieve their goals … to help the Karen people by volunteering at Mae Ra Moe refugee camp or Karen State in Myanmar. Q – Does Project KARE pay for, or subsidize, volunteer trips to MRM? No. We make ourselves available as a resource for information and logistical support. We can also help you to determine whether travel to Mae Ra Moe or Karen State makes sense for you. If yes, then we can assist you with our qualified in-country contacts to help you manage your own travel and visit. Q – Does Project KARE have an office in Mae Ra Moe or in Thailand? No. We’re a small group of three friends in Denver, CO, USA. We make annual trips to camp and we provide information to volunteers who would also like to help the Karen people. Q – What experience & qualities do you seek in a volunteer? We seek the right mix of experience, disposition and character. Native English language skills or English language expertise at that level. Experience traveling to developing countries, including living in very basic conditions. This is a refugee camp. Teaching experience, or other knowledge transfer (not necessarily teaching English). Experience volunteering to help others. Physical fitness for mountainous walks to school in tropical heat. Unwavering respect for others, especially for people of other cultures. Experience mentoring English teachers in teaching methods and practices is helpful. Experience with Karen people or service to other displaced or refugee communities. Q – Where do I start, geographically? The best hub for getting to camp is Chiang Mai (CM) Thailand. From CM it is approx. 7 to 8 hours overland to Mae Ra Moe refugee camp. From CM you can take public transport to Mae Sariang (MSR) …”May suh-ree-uh”. From CM to MSR, half way to camp, it’s approx. 3.5 hrs via public transport. From MSR to MRM – authorized truck/driver hire for the last 2.5 -3 hrs to MRM. Chiang Mai has great shopping options for school supplies if you plan to donate to schools at MRM. Makro Dept. store is great for bulk school supplies! Flight to Thailand, Bangkok (BKK) or Chiang Mai (CNX). If arrive in BKK, add your travel to Chiang Mai (CM) or Mae Sot (MST). Overland travel / transport from CM or MST to Mae Ra Moe (MRM) refugee camp. Lodging and meals before and after your time spent in camp. The Camp Permit costs B1,000 (~US$30) per 2 wks. in camp for up to 10 volunteers. In camp – basic lodging, meals and bottled or boiled water are provided at no charge. Q – What does transport cost from Mae Sariang to Mae Ra Moe Refugee Camp? *When leaving camp, if you can be flexible, you can catch a ride back to MSR with an NGO and pay a nominal price (approx. B1,000 per person). It depends on the NGO. If you prefer to stay overnight with a local in MSR, ask us about a possible homestay. Q – What does transport to Mae Ra Moe Refugee Camp cost from Chiang Mai? You can minimize your costs by taking public transport from CM to Mae Sariang. Current exchange rate: US $1.00 = 30 Thai Baht (as of Aug. 2018). Q – Can I get from Chiang Mai to Mae Ra Moe in the same day? Yes BUT if you are taking the bus or van from CM to MSR with plans to reach MRM all in one day … you MUST take the early bus or van leaving CM at 7 or 8am latest. When a driver goes to MRM they need to leave camp with enough daylight to safely navigate the bumpy road on their return. Also, camp gate closes in the early evening. If you take a bus/van to MSR after 8am you must plan to stay overnight in MSR. Q – Where do I get a Minivan or bus ticket from Chiang Mai to Mae Sariang? One option is Prempracha Transport. They offer minivan and bus options. Their staff has been very responsive. Minivans depart at 7am or 8am (depends on season) and after, from CM to MSR. The ticket price for a Minivan is THB 200 per person (as of May 2018). Private Minivan hire is B3,500 for 7 to 12 people (depends on how much luggage). They offer daily Fan Bus for B95 but it’s not every day and tickets can not be reserved. Busses depart at 8:00, and after, from CM to MSR. NOTE: If you’re bringing extra boxes of supplies, consider buying an extra seat. They don’t have a lot of extra room for storage. Expect to pay extra for storage. Q – If I choose to travel from Mae Sot to Mae Ra Moe, how do I get there? Q – Can I share the truck / transport expense? Yes. The price is for the truck and Driver, for up to 4 passengers. You can get more in a truck if any passengers are OK riding in the back. It’s bumpy! Bring friends and save $$. Q – Is it necessary to hire a driver and a truck to access MRM camp? Yes. Only vehicles and Drivers authorized by the Thai govt. are allowed in camp. And, the last 1.5 to 2 hours of the drive to MRM is on mountainous dirt road. Even in the “dry season” the access road requires a four wheel drive vehicle. In the wet season (monsoon) the road can be impassable due to mudslides. If the roads are too wet for a truck you can get there by boat or even elephant! The truck is also very helpful for transporting school supplies, which we suggest. Q – What are the costs while I/we stay in the refugee camp? For volunteer teachers … lodging, food and water is provided. If you would like to contribute to these expenses, great! See your school Principal. 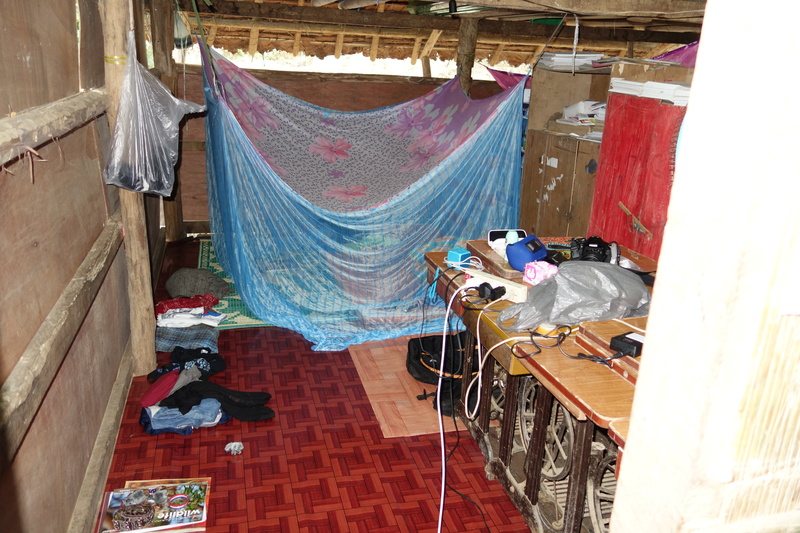 Lodging is basic – thin mat on a bamboo floor, squat toilets, bucket showers. If you’re a shopper, you might bring a little cash to buy Karen clothing made in camp! Q – How long does it take to travel to MRM refugee camp? From Chiang Mai it takes about seven to eight hours total, without lengthy stops. The drive from Chiang Mai to Mae Sariang is 3-4 hours depending on who’s driving. It might take a little longer if taking public transport (from CM to MSR). From Mae Sariang to Mae Ra Moe it takes about 2.5 hours. Nice mountain views! If you’re traveling during monsoon season (Aug. to Oct.) wet road conditions can extend travel times. Drivers might need time to add or adjust chains. Q – What’s the best time to travel to Mae Ra Moe? Best weather is Nov. to Feb. – Dry season. It’s still hot, but not their most hot. Schools are closed from March until the end of May. In the 2nd and 3rd weeks of February some schools are having year-end exams. 4th week of February – no classes for high school, middle and elementary. In May the students and teachers work on repairing all the school buildings. Travel can be challenging, or even delayed, in the wet season – Aug. to Oct. Exam schedules influence best times for volunteer teacher visits. Ask us first. Schools will close for holidays. We’ll review your dates carefully with you. Q – Will I be comfortable there? That depends on you. This is a refugee camp. Very basic living conditions. If you need more than a thin nylon mat on a bamboo floor, you might want to pack your sleeping pads. Don’t plan on western toilets in camp. Squat toilets / eastern style only. No formal showers. Washing is done with a scoop in a barrel of cool water. These ‘showers’ often feel best, even refreshing, in the heat of the day. Wash rooms and toilets are typically in a shed next to the building where you stay. You will be provided with more comforts than any of the refugees in camp. Q – Do I need to be physically fit to volunteer at camp? Yes. The camp is large and schools are geographically dispersed. Walks to school in camp can require agility on wet mountainous dirt paths. The walk to school, depending on where you teach, can be 2 minutes to 30+ minutes. It can take longer, depending on weather and your physical ability. Walking in camp can be strenuous, including steep hikes, in very hot weather. Most travel is by foot on dirt paths. There is no public transport in the refugee camp. Temperatures in camp, even in the ‘cool season’ will be hot, often very hot. If you enjoy hiking and don’t mind tropical temperatures … this is a good fit! Q – What’s the weather like? See above. Thailand is on the equator. Nov. to Feb. – Dry season. Typically high temps during the day, cool in early AM. Dec. to Jan. is usually most dry and least hot, but it’s the tropics so it is still hot. March to July – Hot season, some rain, progressively more rain. April is typically the peak of their hot season. August to October – Wet / monsoon season – pack rain coats, boots. August is typically the peak of their wet season. Q – Do I need a permit to enter the refugee camp? The Karen Refugee Committee (KRC) and Thai authorities need to sign off. Q – Can you help me to obtain a camp permit? For volunteer teachers, yes. We will introduce you to the proper in-country contact. You must be aware the Thai govt. can always refuse or delay access. However, we have helped many volunteers with zero delays. IMPORTANT NOTE RE CAMP PERMITS! It is critical that you DO NOT OVERSTAY your Camp Permit. The Thai Governor now monitors volunteer dates to be sure this does not happen. This can be managed fairly easily but you MUST be diligent. If a volunteer overstays a Camp Permit this will cause problems – for the volunteer, the Camp Leader, the Karen Refugee Committee (KRC) and for future volunteers. Penalties are unclear (this is new) but could include fines for all of the above, cessation of all volunteer visits, possibly more. To avoid this it is important to understand the Camp Permit process and to coordinate with our contact in Mae Sariang for additional permits as needed. Each Camp Permit is valid for 15 days. If you are staying in MRM more than 15 days please leave enough money (Thai Baht) with our Camp Permit contact for her to be able to get additional Camp Permits to extend your stay for the anticipated duration of your stay. Our contact will reimburse you any money she does not need for camp permits. Camp Permits cost B1,000 (Est. 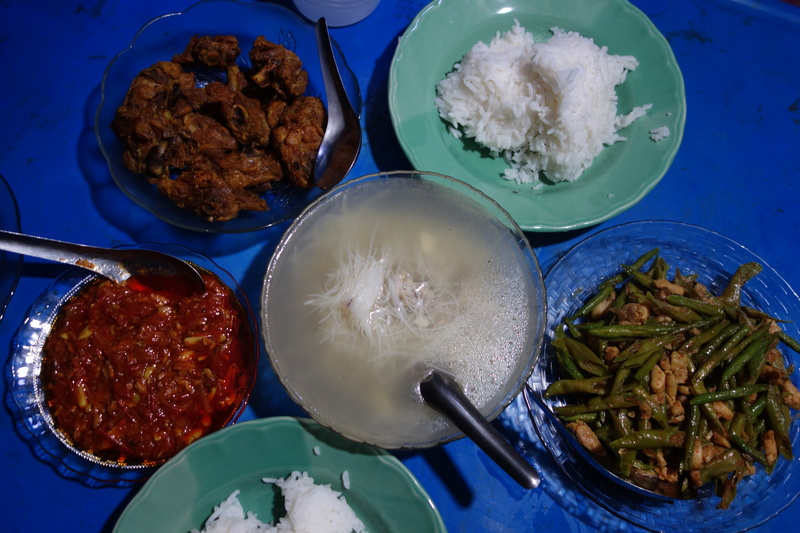 $US 30) per 15 days in camp but this cost can be shared with fellow volunteers who are arriving at the same time as you. If you are unsure of the length of your stay prior to your trip you can contact our Camp Permit contact from inside camp to extend. Please inform our contact several days in advance of your Camp Permit expiration. If you are already in MRM and need an extension, our permits contact will try wherever possible to save costs on your new permits by adding you onto Camp Permits for any visitors arriving after you. Our Camp Permits contact is exceedingly honest and hardworking to take care of volunteers helping her Karen people. Q – Do I need a special Thai visa? No. A Tourist Visa is perfectly fine. Anything else simply complicates that step. Q – How long can I stay and teach? Typically, volunteers teach for 2-3 weeks up to two months or more. Leaders in camp prefer at least 2-3+ weeks but less might be OK too. US citizens get a 30 day Thai tourist visa on arrival. 60 day tourist visas are available but you must apply at the embassy in advance. Longer stays are possible but Thai visa issues can arise beyond one to two months. If you obtain a 30 or 60 day Thai visa you will likely have to leave the country, at least briefly, and re-enter Thailand to be awarded a new Tourist Visa. Q – I have not taught English before. Can I still volunteer? Tell us about your applicable experience and we can decide together. Many people have directly applicable knowledge share experience. We seek native English skills, or English language expertise at that level. Q – Would I be teaching classes myself or would I be helping a teacher? You would be teaching the class. You would be responsible for arriving at camp with lesson plans for the duration of your stay – an arsenal of learning exercises and classroom activities for teaching English. Here are some helpful tips for teaching at MRM. And here are some links to free ESL teaching resources. While teaching at camp you would be matched up with a Karen English teacher. The Karen English teacher would be there to support you with translation and more. They would also enjoy learning from you! Q – How many students are in the classrooms? At High School No. 1 the classes are typically 25-35 students. At High #2 (KAA) classes are typically 30 or ~65 students. At High School No. 3 classes typically have 30-40 students. At MRM Jr. College classes tend to have 25 to 30 students. At PDC … classes are typically under 30. Q – What other subjects would be helpful? Teaching English is most important. Education leaders and school principals in camp seek native English speakers. Teach the teacher. If you can train and mentor English teachers, even better! Resettlement education, First-Aid, other Healthcare and Medical topics and more! See the Subjects to Teach page. Q – Is it safe in camp? Yes. There’s not much use for locks at Mae Ra Moe. The Karen people are a very close community. Camp is like one big family. Respect for others is very much part of the fabric of their culture. Foreigners are respected and your visits are greatly appreciated. Teachers are also held in especially high regard. Foreigner teachers – wow! Q – Is the food and water safe? Bottled and boiled water is provided for drinking. Boiled water is also provided for tea and coffee. I’ve always enjoyed the food and have never had stomach issues while in camp. However, it’s not uncommon for world travelers to encounter occasional GI issues. Some people tend to have more dietary tolerance than others. Consider packing prevention and treatment medication. Consult your physician. Seasoned world travelers often pack Imodium (or similar) and electrolytes powder. Q – Is there malaria in this area? Malaria is present in the area of Mae Ra Moe Refugee Camp. Many, maybe most, camp residents have contracted malaria before. Some people have had it multiple times. If you travel during the dry season (Nov to Feb) exposure to mosquitos is much lower. As with any travel to destinations where malaria exists you should consult your healthcare professional and/or travel clinic for professional guidance. Q – Is electricity available? Volunteer teachers are provided access to power for a few hours each day for charging electronics, and for light in the evening to work on lesson plans, etc. Most of the population in camp does not have electricity in their homes. Classrooms don’t have electricity. They’re wood, bamboo, leaf roofs and dirt floors. Q – Is there Internet available in camp? It’s generally too slow for posting photos but you can typically access it daily to stay in contact via e-mail and text. It’s slow! Think “dial-up” speeds. Any time of day you can walk to one of the few area ‘Internet huts’. The walk-time to Internet an hut near you depends on the school where you teach. Lesson plans, ESL exercises and activities – be prepared for your classes. If you’re new to teaching – ask your teacher friends for help. Be prepared! Flip flops – easy slip on, slip off shoes. You’re invited into many homes and are constantly taking your shoes on and off. Almost everyone there wears flip flops. Head lamp – for late night trips to the out house, etc. Good hiking sneakers for mountainous walks. Hiking boots if not in ‘dry season’. Umbrella – if you’re traveling during the wet season. Easily found in Chiang Mai. Toilet paper – it is provided, and abundant, but do you want to take any chances? Camera and lots of digital storage. Q – Other things to consider bringing? Sleeping pads (If you need more than a thin nylon mat on a bamboo floor). Anti-bacterial, baby wipes, wet naps, hand sanitizer. Sun screen (For weekends. You’ll mostly be in classrooms during school days). Mosquito repellent (Typically not so many mosquitos in Dec/Jan, but pack smart). Maybe a comfortable pillow, if you’re volunteering for an extended stay. Consider a travel shower (The only way for a warm shower, a nice luxury). Q – What should I pack in my traveler’s First Aid kit? Q – I want to bring donated school supplies. What should I bring? Ask us first – priorities and most urgent needs will fluctuate. We will introduce you to the school Principal or Teacher who can advise. Used laptops – ask your friends & family to donate – these are very helpful! Copy paper, student notebooks, pens, pencils, colored pencils, chalk, erasers. Printers – Canon brand preferred – they can share parts with existing printers. See more details on our Shopping List page – we update this frequently. Again, needs in camp change – contact us for updated priority list. Q – If I want to shop for school supplies to donate in MRM where should I go? Chiang Mai has great shopping options for a wide variety of school supplies. Makro Dept. store is great for bulk supplies – pens, pencils, notebooks, A4 paper. Makro is about a 20-25 minute ride out of the city by songthaew (red taxi/truck). Makro doesn’t have the widest variety but has great volume of primary needs. Chiang Mai Plastic is in CM city and has a broad inventory of school supplies. Chiang Mai Plastics is best for variety – chalk, erasers, flip charts, poster board, etc. Computer Plaza Chiang Mai is great for electronics – printers, ink, computers, etc. If you are buying bulky or heavy items ask us if you can find it in Mae Sariang. CM is much better shopping for variety and prices – but it if you’re taking public transport from CM to MSR it can be hard to transport some things – flip charts, white boards, chalk boards, lots of A4 copy paper, etc. Consider that it’s much easier to put the big or heavy items directly into the back of your truck in MSR on the final drive to MRM. Q – Once I commit, is there anything else I should do to prepare? Consider bringing a small gift for the English teacher (Karen person) who will partner with you in the classrooms when you teach. They’re a BIG help! Consider bringing photos and videos of your family and home country. Everyone will be very interested to learn about you and where you come from. Bring fun music – I’m told some students love a good dance party! Consider packing snacks. The food provided is nice but there’s not much variety. Prepare a brief presentation for a morning assembly (5-10 minutes is fine). The education leaders in camp really appreciate you encouraging students to study. Leave room in your luggage to take parting gifts home with you. Q – What is proper clothing to bring? Teachers are highly respected. Dressing appropriately honors that. To respect the Karen culture – modest clothing is appropriate. For men – a shirt with a collar is nice. Long pants are best. Shorts are OK too. For women – long pants, or skirts (covering the knees). Those Thai pants are great! Shorts and tee-shirts (or similar) are perfectly fine. Flip flops are convenient (expect to take your shoes off before entering homes). For longer walks in dry season – be sure to pack hiking sneakers. For wet season – hiking boots, a few pairs of socks, a raincoat and an umbrella. Q – How long in advance should I plan? We recommend, where possible, you start at least a couple months before arrival. First – we’ll address your questions after you read the Volunteer Q&A thoroughly. Next – we’ll schedule a video chat discussion. Expect 45 to 60 minutes. We’ll try to introduce you to other volunteers to share the truck/driver hire expense. We help you obtain a permit to camp. Plan to initiate that 4+ weeks prior to arrival. Book your driver and truck for MSR to MRM – we’ll provide you with contacts for this. This is not a trip well suited for last-minute plans. Q – Anything else I should do to prepare for the trip? If it is practical for you, we highly recommend you have a fundraising effort to bring school supplies with you to donate to the students and education leadership. Funding for education is very limited at Mae Ra Moe and even very basic materials (pens, notebooks, copy paper, etc.) are in very short supply. Please help if you can. We can confirm the most urgent needs at the time of your visit. Once you arrive and see how deep the needs are, you’ll be very happy you helped. NOTE: For backpackers, on a shoestring budget, your gift is your time. Thank you!! Q – How do I learn some Karen language before I arrive in camp? Here is some VERY useful classroom phrases in Karen for teachers. These links include audio to Karen language pronunciation of these phrases. Q – What else should I know to help plan for a smooth trip? Communicate clearly (i.e. dates, times) with us and our contacts we share with you. Stay in touch with us and the key people we connect you with on Facebook. Review the Karen Culture section on our web site to ensure respectful interaction. Q – Any recommendations of things I should do or see in Mae Ra Moe? Accept invitations to homes of your students, teachers, any of your new Karen friends. Walk around camp. It’s really big! Walk slowly. See how many kids follow you. Treat yourself to a visit to a nursery school – cuteness overload! Plan a walk to the big waterfall. Maybe have a swim! Learn to play cane ball. Join a soccer (football) or volleyball game. Take a boat ride up the Mae Sariang River through camp on a long tail Thai boat. Attend a church service. The Karen are faithful people. Go to the ‘morning market’ near High One at 6am on Fridays and Mondays. Go to the market near PDC & the main road, a market run by the muslim community. Share your personal passions – music, dance, theater – your students will love it! High School No. 3 – This school is remote, far from the other schools. This is well suited for the adventurous traveler, teacher. They’ve seen few volunteers. Fun! Q – Can I learn more, ask more questions. before committing to volunteer? Just send a message we’ll begin our dialog. Q – Should we talk directly or have a video call in advance? Yes. If you’re serious about making the trip, we’ll plan a video chat. Facebook is best. It’s the primary communication for contacts for your trip. Q – Is it OK if I commit to volunteer and then change my mind? Please only commit if you are certain. Want a preview of what you can expect as a volunteer at Mae Ra Moe? Check out our five minute video of the volunteer experience. Thanks heaps to Kiri and Troy, volunteer teachers and film makers from Idaho in the USA. Kiri and Troy volunteered in Jan. 2018.